The Society of Allied Weight Engineers (SAWE) is an international organization whose purpose is to promote the mass properties discipline and provide members and industry a medium for exchanging practices and experiences with the objective of fostering a higher degree of quality in mass properties control. Regular chapter meetings, regional and international conferences, plus an array of technical papers, reference books, industry standards and training curriculum provide mass properties engineers and industry that opportunity to learn, collaborate, create, and broaden the capability of the mass properties engineer, organization or program. The Society is organized into 22 chapters with members from across the United States, Brazil, Europe, United Kingdom, and Canada. Hilton Norfolk - "The Main"
It is time to renew your membership for the upcoming SAWE fiscal year running from May 1, 2019 through April 30, 2020. Renewal or application for membership can be done on-line at the following links. Check with your Chapter Treasurer for more details or ways of renewing your membership. (Login required. See Frequently Asked Questions or contact us). 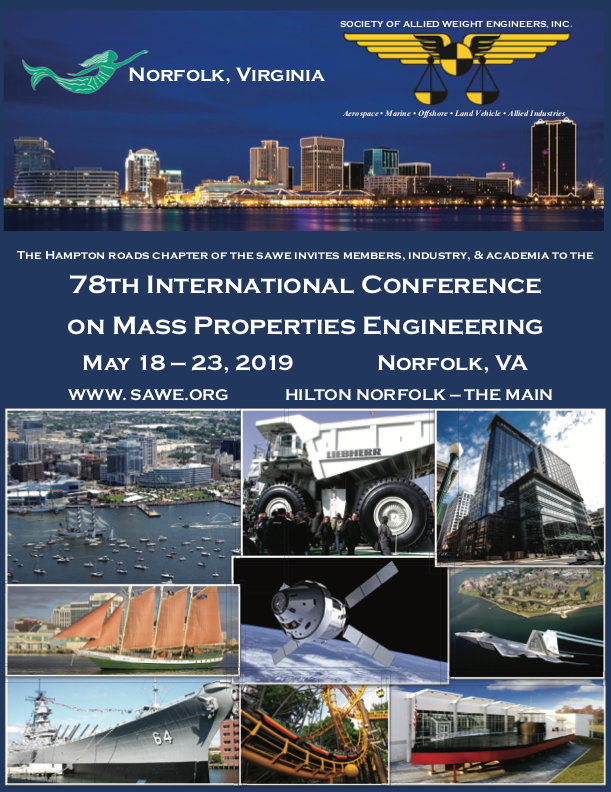 As a result of your membership this past year, the SAWE has been able to continue providing value to the mass properties engineering community, the industries they represent and to the service providers that enable mass properties engineers to ensure vehicles meet their performance and safety objectives. Please take a moment to read SAWE President Bill Boze’s letter to all mass properties engineers to learn more. Now more than ever, the SAWE needs your continued support to address the risks and opportunities you helped identify from the industry wide health of mass properties engineering survey conducted in 2018. So please invite your colleagues to read this email including the letters, and encourage them to renew, rejoin, or join SAWE for the first time. 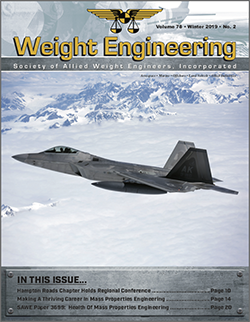 SAWE Members may download the PDF version of the Winter 2018 Weight Engineering Journal for free. Log-in to your membership account is required. For more information about how to setup or access your membership account, please view our Frequently Asked Questions. Each year the Society of Allied Weight Engineers, Inc. sponsors the SAWE Scholarship Program. Applicants must be children* or grandchildren (age 25 and under) of members of the SAWE worldwide who have a minimum of one year of membership as of the application deadline date. Children of deceased members are also eligible. *For purposes of this program, children are defined as natural and legally adopted children or stepchildren of members. Applicants must be high school seniors or graduates who plan to enroll or students who are already enrolled in a full-time undergraduate course of study at an accredited four- year college or university. The SAWE is actively soliciting papers and presentations for the following Regional and International Conferences. Since 1939, the Society of Allied Weight Engineers has been promoting recognition of mass properties as a specialized discipline. The principal means for accomplishing this objective is the annual conference for presentation of papers and discussion of engineering standards and recommended practices. Papers and reports are published and distributed. Abstracts should include the paper title, author's name, position and company affiliation. They should be 250 - 350 words in length and should contain a statement of the problem or objective, the method of approach, and a summary of conclusions. The abstract should not deal with specific data. To submit abstracts or for more information, please use our contact form. Nominations for Honorary Fellow, Fellow, Richard Boynton Lifetime Achievement Award, and Ed Payne Award (for Outstanding Young Engineer) are due March 1st, 2019. Chapter Directors are responsible to canvas their chapter membership for members worthy of these awards and to submit candidates to the International Awards Committee. 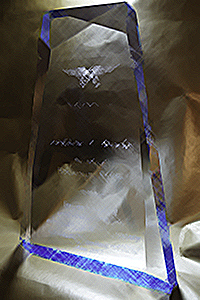 These prestigious awards designate an elite group of contributors to the SAWE and the field of mass properties engineering. Please review the information below and the attached nomination forms as guidance. You may also refer to the SAWE Bylaws and Operations Manual.